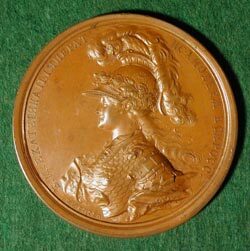 Obv: Bust of Catherine; Legend in Cyrillic translated as: "Catherine II Empress and Almighty Ruler of Russia". Rev: Russia and Religion holding wreathed monogram over alter; Genius in clouds above, holding Crown and Scepter; Legend in Cyrillic translated as: "For Your Salvation". Catherine the Great (1729-1796) was born in Poland. In 1744 she went to Russia at the invitation of Empress Elizabeta Petrovna as the bride of the heir to the throne, Peter Feodorovich, whom she married in 1745. 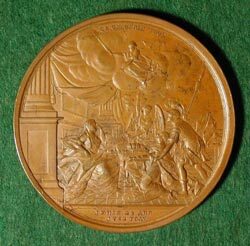 In 1762, with the support of the Imperial Guard, she overthrew her husband Tzar Peter III and was crowned Empress of all Russia, the event commemorated by this medal. Catherine undertook a wide range of social reforms, although after the Peasant's Revolt she became increasingly conservative and extended the powers of the nobility at the expense of the serfs. In the foreign policy arena, she waged two successful wars against the Ottoman Empire and occupied vast territories on Russia's southern boundaries. The Partitions of Poland led to the division of that country into Russia, Prussia and Austria. Russia emerged from the Russo-Turkish War (1768-1774) as the dominant power in the Middle East. Crimea was annexed in 1783 and Alaska was colonized. Catherine's dialogue with Enlightenment figures such as Voltaire did much to promote her contemporary image in Europe. She and was buried in the Cathedral of St. Peter and St. Paul Fortress in St. Petersburg.